Rather than stay put in Miami for the duration of the 4th of July weekend, I was able to fly out to Milwaukee to see my family, and then drive down to South Bend with Brian for two days. Because there are so few quality restaurants in South Bend, we rarely have high expectations for the restaurants we visit. Nevertheless, we decided to try out Granite City Food and Brewery located at the University Park Mall. To our surprise, the restaurant exceeded our expectations from start to finish. After thoroughly studying the menu, we started off the meal with some drinks. I ordered white sangria with white wine, peach snapps, triple sec, and some fruit/fruit juices. Brian was a little more adventurous and opted for the Elijah Craig Kentucky Sunset (bourbon, chocolate liquor, orane juice, and house made honey). We were a bit wary of how the chocolate and orange would go in the drink, but fortunately the two flavors were rather mild and did not overpower the whiskey. 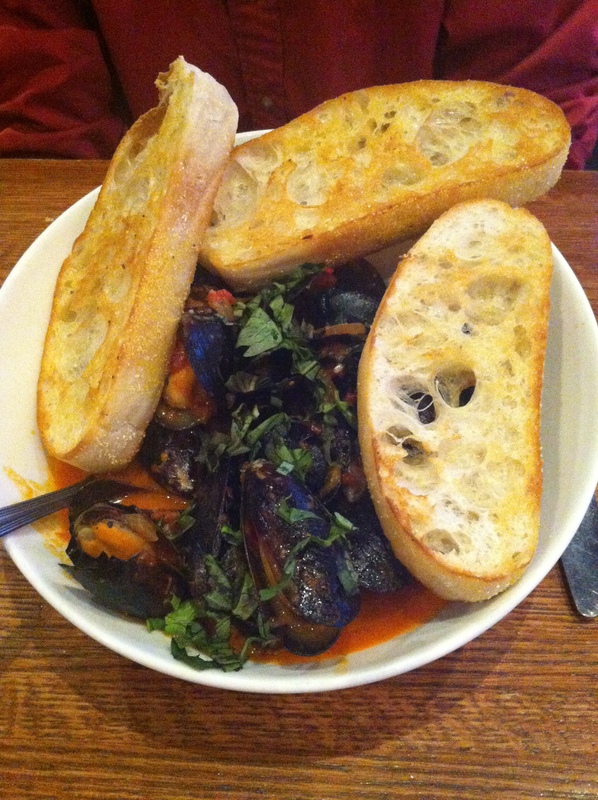 For our appetizer we ordered vodka mussels, a tomato-vodka based dish that came with three slices of wonderfully crisp but soft garlic butter bread. It is really hard to emphasize just how perfectly toasted but still soft the bread was- the perfect way to begin the meal. The soup was warming and flavorful with a lightly rich and garlicky touch that kept us dipping our bread to soak up more. I ordered the fish tacos, which came in flour tortillas and topped with lettuce, tomato, cheese, salsa, sriracha mayo sauce and a serving of Spanish rice on the side. 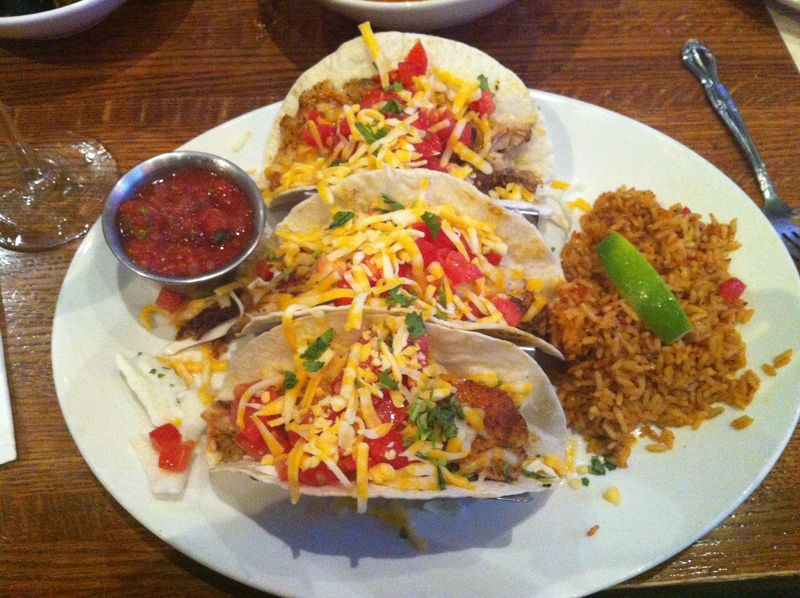 All of the ingredients were very fresh, making the tacos filling and satisfying, but not heavy. Brian’s dish was definitely the gem of the meal. 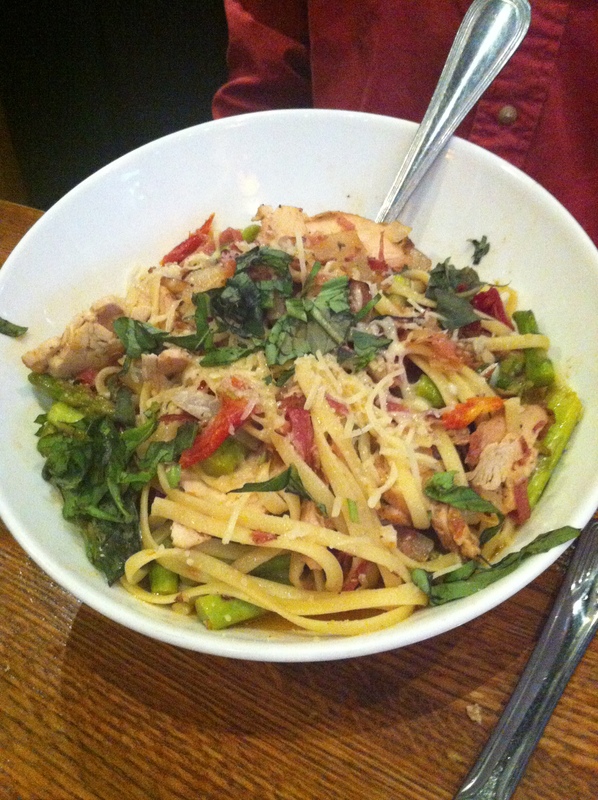 He ordered fettuccine with asparagus, chicken, prosciutto, garlic, sun dried tomatoes, fennel, and basil. The sauce was so light and simple, really showcasing the many other “goodies” of the dish. Even the pasta was cooked to an al-dente perfection, making us glad that we had enough for a good leftover portion. Granite City definitely gained our stamp of approval after this interesting and flavorful dinner. We only hope that we can expect consistency in their quality for the coming school year and that it can become a favorite go-to restaurant.